Firstly I’d just like to say thanks to Writer/Director, Chris McInroy for allowing me access to an online screener of his 5 minute, Horror/Comedy short “Death Metal”. Death Metal is about Lars (played by Kirk Johnson), a metal head whose lacking in the talent department. One day his father (Michael Dalmon) passes down a satanic guitar said to help one shred gnarly riffs…. but it comes at a cost if you don’t follow the rules, something Lars finds out the hard way. McInroy and Johnson teamed up previously a couple of years back on Chris’s short “Bad Guy #2” which was an absolute blast *see review* https://adamthemoviegod.com/bad-guy-2-review/. I’ve been eagerly anticipating something else from these guys and it comes in the form of a Peter Jackson esq (Bad Taste and Braindead) gore fest. It doesn’t take much to peak my interest when it comes to the Horror/Comedy sub-genre. Occasionally you’ll get something that tries a little too hard or doesn’t quite get the balance right but when it’s done well, there’s nothing better than watching a gory humorous romp. Much like in Bad Guy #2, the production value in this one is impressive. The camera work is steady and the framing consistent. There’s also some gentle zooming, aimed to highlight Lars being caught off guard with the events that unfold. The tight and snappy editing works well in such a short run time and the couple of well-timed comedic moments are fun. The design of the satanic guitar was impressive, it looked very black metal and came up nice on-screen. Much like Chris’s last short, Death Metal is all about the carnage and showcasing plenty of those practical effects we all love. Bad Guy #2 was twice the length of this quickie, so there was room to pack in a bit more but the kills here are just as glorious. A healthy (or unhealthy as it would seem) variety of deaths make this a very fun watch. It’s kind of ironic but the only disappointing part about Death Metal is the death metal itself. 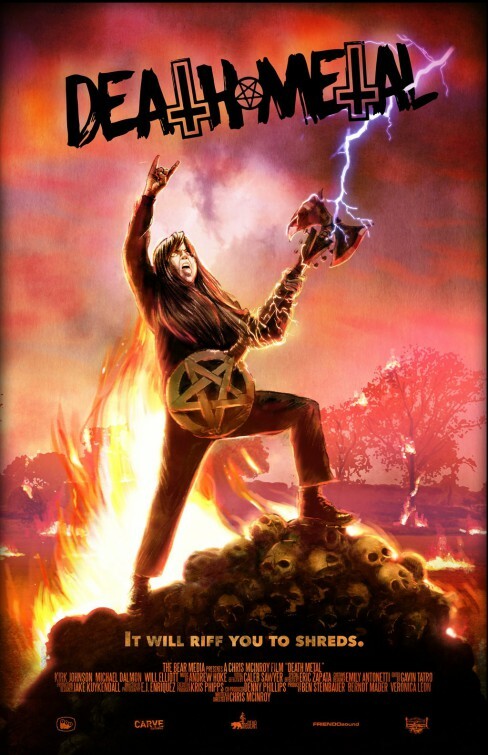 I’m a metal fan and the lack of skillful riffing in this one is the same complaint I had with last years New Zealand, Horror/Comedy “Deathgasm”. Chris McInroy delivers yet again on both fronts in his latest short, Death Metal. He belongs in this genre and if all is right in the world he’ll continue to be able to make these sorts of films. All the technical aspects are well executed, the body count is high and the practical effects are impressive, given the modest budget. This is easily recommended for repeat viewings, the shorter running time the only thing stopping it from being as impressive as Chris’s previous film. Make sure you check this one out when it becomes available, it will riff you to shreds!